SKU: 262648. Categories: Fashion, Flare Skirt, Skirts & Dresses. Tags: #ModernWitchLife, magical, pagan, wiccan, witchcraft, witches, witchy, witchycartoon. Every girly witchy babe needs one of these stylish & super comfortable, flare skirts! Made from performance wear fabric (88% polyester 12% spandex) and treated for moisture wicking to keep you comfortable, this ultra-stretch fabric holds shape even after multiple wearings. High-waisted, the elastic of this flare skirt will generally rise just under your belly button for most sizes & fall above mid-thigh on most people. It features a thick elastic waistband finishing, cover stitched hems and is made with EcoPoly, a production process that uses a third less energy and water than typical polyester production processes. 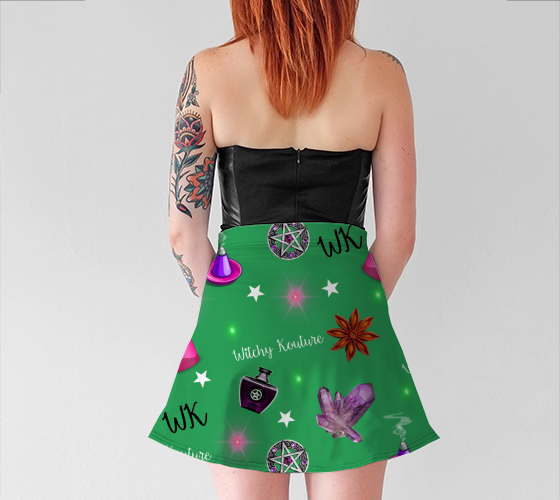 It is vibrantly printed and sewn to last, by hand in Canada with an original Witchy Kouture green print featuring illustrated witchy tools & accessories, the quality of the print will never fade or lose shape with wear & washing. Perfect wardrobe staple for witchy fashionistas!